Freed-Hardeman University’s first Alumination Day in September offered alumni the opportunity to return to campus to inspire current students. FHU President David Shannon suggested the event early in his tenure. The Ambassadors work under the auspices of the admissions office. They perform frequently at gatherings of young Christians, including churches, schools, RUSH, Challenge Youth Conferences and other events. Mallory Bowman, studio art student, uses her gifts for His glory by creating works of art inspired from her mission work. Explore your academic goals at http://www.fhu.edu/academics. “If I didn't already have some idea about ‘Precious Memories,’ I definitely do now,” Winston Harless, former director of the Sonshine Singers, said as he thought about their reunion Feb. 5-6, 2016, in Sheffield, Alabama. “God certainly blessed us with a wonderful reunion,” he concluded. The 81st Annual Freed-Hardeman Bible Lectureship, "Identity in Crisis: Daniel's Vision for the Future," was held on February 5-9, 2017. Thank you to all who attended. Learn more at fhu.edu/lectureship. Freed-Hardeman University's Doctorate of Behavioral Health serves as a flexible program for medical professionals who desire to further their education. For more information, visit fhu.edu/dbh. Andrew Johnson, class of 2017, is using his gifts for His glory on his journey to becoming a chemistry professor. Explore your academic goals at fhu.edu/academics. Darren Heintzman, class of 2017, plans to use his gifts for His glory as he prepares to attend graduate school and study interdisciplinary biomedical sciences. Explore your academic goals at fhu.edu/academics. Patrick Spears, class of 2016, plans to follow in his family’s footsteps by pursuing a career in the criminal justice field. Attending Freed-Hardeman University helped him discover his gifts for His glory. Abby Lambert, class of 2016, is the fifth member of her family to attend Freed-Hardeman University. Lambert plans to use her gifts for His glory in the world of theatre by being a shining light in a typically secular industry. Sophia Fornbacher, class of 2016, came from California to Freed-Hardeman University to enhance her gifts for His glory. Fornbacher was accepted into the Medical College at Boston University. Giving and serving are a part of FHU students' DNA. This fall, numerous students have given of themselves to help others. From special needs children to senior citizens, from Henderson to the world, students have impacted the lives of those around them and those far away. Whether ten watts or 3,000 watts, Freed-Hardeman University's campus radio station has served FHU and Chester County for a half-century. The station celebrated its 50th anniversary during Homecoming 2016. “This was not only a journey of discovery about the larger world, but it was also one of self-discovery,” Linda Moran said as she discussed the July 2016 Madrid Study Abroad program. Eleven Freed-Hardeman University students joined Moran, FHU Spanish instructor, for the month-long Spanish immersion course. A dedication ceremony for the newly renovated health sciences wing at FHU/Dickson was conducted Thursday, Sept. 29, 2016, with approximately 100 persons in attendance. Educator Antonio Burt is one of four inaugural graduates of Freed-Hardeman University's Doctor of Education program. Burt has worked in Memphis City and Shelby County Schools, where he focused on improving academic performance in struggling schools. He now provides instructional and leadership coaching to the lowest-performing schools in the district as the director of school transformation in Pinellas County, Florida. FHU students inspire others and make their world better now. Faculty and staff provided feedback for FHU student Brandon Gosselin before he finished in the Top 300 speakers in the world through Toastmasters International. The FHU family gathered April 8, 2016, to celebrate the realization of a beloved librarian's dream and thank John and Rosemary Brown and other donors, as the Hope Barber Shull Academic Resource Center was dedicated. A look at the Spring 2016 semester with FHU Study Abroad. Four months into her second century (as she puts it) FHU basketball alumna Bertha DeHoff Smith looks back at a life filled with hard work, hard times and love. Seven FHU nursing students journeyed to Thomazeau, Haiti, in January 2016, hoping to make a difference in patients' lives but they were unaware of the difference the patients would make in theirs. Nolan, Ana, Evan and Nina share their experiences as Freed-Hardeman students and intercollegiate athletes — and why their most important work is using their strength for God's glory. After spending more than a decade building a collection of rare Bibles and other manuscripts, David and Paula Tarbet have chosen to give their collection to Freed-Hardeman. N.B. Hardeman’s granddaughter and other relatives walk the paths family members did when their work began impacting the world from the small town of Henderson. The FHU family celebrates the realization of a beloved librarian’s dream and thanks John and Rosemary Brown and other donors at the dedication of the Hope Barber Shull Academic Resource Center. Freed-Hardeman University women’s soccer player Ana Aponte was named the 2016 Heart of a Lion Award recipient. The Charlie Smith Heart of a Lion Award is given annually to an FHU senior athlete who has demonstrated qualities of courage, determination, hard work, exemplary performance and service to others. Faculty members Drs. Richard and Barbara England and learning center coordinator Connie Pritchard accompanied Freed-Hardeman students to Europe for the Spring 2016 semester. As the world woke to headlines about terrorists’ attacks in Brussels March 22, the three leaders implemented plans and maintained constant communication with students, families and administration, as events unfolded. The following pages contain excerpts from Barbara England’s journal during those days. Four months into her second century (as she puts it) Bertha DeHoff Smith looks back at a life filled with hard work and hard times; however, thanks to friends and a family filled with love, she can say, "It all worked out just fine." Years ago, in the Medieval Ages, ancient biblical manuscripts contained detailed illuminations –colorful drawings that filled the pages and supplemented the text. As time has passed, fewer and fewer illuminated manuscripts are being published with exception of children’s Bible storybooks. Fortunately, the lack of detailed illustrations has not slowed down spiritual growth of Christians everywhere. Freed-Hardeman students, in particular, are excited about journaling in their Bibles. Nursing professor teaches students more than healthcare during mission trip to Haiti. Freed-Hardeman University has named Jim Sanderson, former head coach at Faulkner University, the new head coach of the Lion basketball program. He began his duties June 1. Freed-Hardeman University will add track and field to its intercollegiate offerings next spring, according to Mike McCutchen, athletic director. Derrick Spradlin, cross country coach, will also coach the track and field team. We applaud each person whose hard work provided incredible memories for our students (past, present and future), families and friends at Makin’ Music 2016! Thank you for making our 39th show amazing. Keep up with plans for #MakinMusic40 at http://fhu.edu and https://www.facebook.com/freedhardeman. Freed-Hardeman University is thankful to be part of the Dickson community at the Renaissance Center, partnering with Nashville State Community College and offering bachelor’s and graduate degrees in Middle Tennessee. Learn more at fhu.edu/dickson. Are you and your friends ready for your summer adventure on 77 acres of magic? Our Mid-South family will tell you that something special happens at this faith-focused, life-changing, inspiring, joy-filled, eye-opening, uplifting camp. Make memories singing, reading, dreaming, hoping, growing, rowing, climbing and sliding... together. Learn more and register at fhu.edu/msyc. What do Dr. Joe DeLay’s infinity chalk line, chocolate goop, IHOP, goats, bonfires, painting the lion, caroling and Dr. Wiley’s bling have to do with your future? Ask our students and alumni, and join our FHU family, where talented faculty not only teach you today, they’ll encourage you for a lifetime. Their mission is to prepare you for your future. Your future: His glory. Learn more at http://www.fhu.edu/admissions. Freed-Hardeman University has named the director of the university’s nursing program at Dickson scheduled to begin Fall 2016. Robert Spencer, a seasoned nurse educator and practitioner, began working with FHU Monday, Feb. 15, 2016. With hard work and time management as their foundation, siblings Mitchell and Weston Keen, along with Mitchell's wife Jessica, discovered the perfect prescription for success. Freed-Hardeman University alumni and recent Pharm. D. graduates of the University of Tennessee Center for Health Sciences, Mitchell and Jessica are employed by Kroger pharmacies in Knoxville and Maryville. Weston is in his first year of study at UTCHS. A new leadership team for Mid-South Youth Camp, operated by Freed-Hardeman University, will take the reins for Summer 2016. FHU President Joe Wiley made the announcement Monday night, Feb. 8, prior to the evening session of the university's annual Bible lectureship. 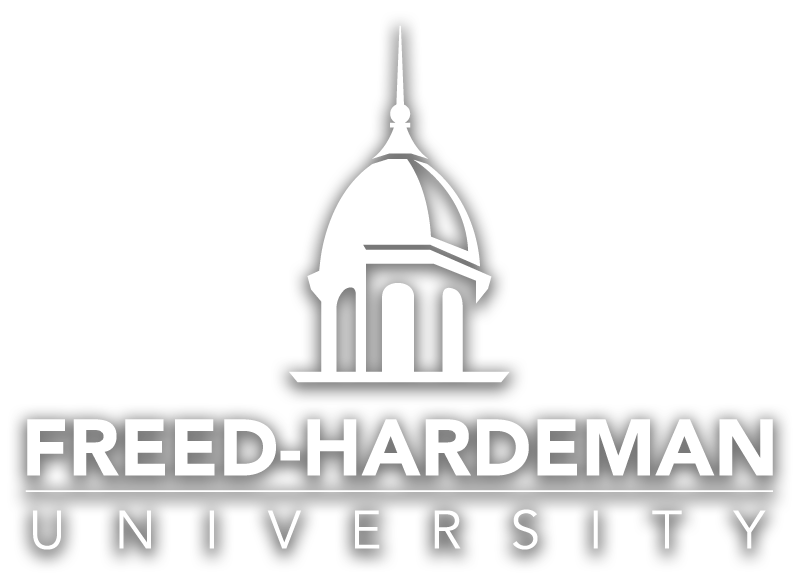 Freed-Hardeman University will host the 80th Annual Lectureship Series, “In My Place: The Servant Savior in Mark,” on the Henderson campus Feb. 7-11, 2016. While this year’s event will add new programs for the needs of today’s audience (http://fhu.edu/lectureship), it will build on a rich history. From our students to faculty and staff to alumni and donors, we’re thankful for the examples of giving we see each day. Because you give, Freed-Hardeman remains a shining light in a dark world. We are 72,254 strong – students, alumni and friends of Freed-Hardeman University – side-by-side, giving time, talents and treasure. Thank you for allowing your legacy to reflect His glory. We're thankful for our Freed-Hardeman University faculty and staff, who use their mission for His glory. "I love the building, my sons love the building, and I bet my grandchildren will love it when they get old enough to come," Dr. Don Shull, retired English professor, said of the Hope Barber Shull Academic Resource Center, named in memory of his wife, Hope. Dr. Don Shull, Freed-Hardeman University Professor Emeritus of English and husband of the late Hope Barber Shull, and Wade Osburn, FHU Library Director, spoke about the Hope Barber Shull Academic Resource Center on its opening day, Monday, Feb. 1, 2016. Prospective students, students, alumni and friends are invited to the center’s dedication Friday, April 8, 2016, at 1 p.m.
Dr. Kent Brantly, the speaker at Freed-Hardeman University’s 51st Benefit Dinner, recorded a message to encourage FHU students to be grounded in Christ, learning to love the Lord their God with all their heart, soul, mind and strength and to love their neighbors as themselves. Seven members of Mark Steiner's Business Strategies class answered the call to research a company, seeking to find the secrets to its success. They also sought to determine the role the chief executive officer played in that success. The company was Stryker Corporation and the CEO was John Brown, who, along with his wife Rosemary, are FHU alumni as well as the naming donors for the building in which the students are studying business. They've Got Fish to Fry. For more than 30 years, folks in Lewis County, Tennessee, have been frying fish for a good cause. In 1982, two graduates of Freed-Hardeman, Jeff "Boo" Spears and Seth Chandler, returned to Hohenwald with the idea that other students should be able to enjoy what they had just experienced—a Christian education. The Clayton Investment Team, comprised of eight students and coordinated by two faculty advisors, has managed a $1 million stock portfolio since 2006 when Jim Clayton, chairman of Clayton Bancorp, Inc., provided the funds for the initial investment. Since the fund inception, the students' consistent approach has generated earnings of more than $500,000 while providing an invaluable educational experience. FHU student Midly Jadis talks about his life at FHU and how student scholarships funded by the FHU Christian Store help students like him. Learn more about the FHU Christian Store at http://christianstore.fhu.edu. At Freed-Hardeman University, we help students prepare for life, develop their skills and participate in Christ's Kingdom. With study abroad opportunities, Honors College, the Clayton Investment Team, mission trips, Makin' Music, athletics and much more, there is something for every student to develop talents to serve and lead. Come to FHU, where faith and reason create Christian leaders. One-week mission trips during spring break can have a powerful impact. For some students they light a fire that leads them to full-time mission work. Sigma Rho’s annual trips to the Dominican Republic have done just that. If FHU friends and alumni can raise $550,000 in “new money” this fiscal year, Howard and Janice Tibbals, along with two members of the Board of Trustees, have agreed to match that total. The challenge grant began June 1 and will continue through May 31, 2016. "Live a Life of Distinction"
Trustee John Law urged approximately 250 graduates to lead lives of distinction as they embarked on their careers. The faculty presented its highest honor, the Faculty Scholarship-Leadership Medal, to Morghan Parker, a chemistry major from Portland, Tennessee. Lion and Lady Lion teams won three conference championships this year. In only their second year of competition in the American Midwest, FHU teams proved a force to be reckoned with. Interest is high for the 51st annual benefit dinner Dec. 4. People are eager to hear Dr. Kent Brantly, medical missionary and Ebola survivor, tell his story of faith and survival. Ticket sales and sponsorships are keeping pace with those of last year, according to Dave Clouse, vice president of university advancement. It’s been a banner year at FHU—literally. Maroon and white banners featuring the new logo now fly in Heritage Commons as well as other places on campus. They herald a campus whose face is changing.